One of the many benefits of being a London Transport Museum volunteer is that from time to time one gets invited to events that aren’t normally open to the public. Recently the Corporate Archives Unit at Transport for London ran an internal event at 55 Broadway as part of the Underground 150th anniversary celebrations. 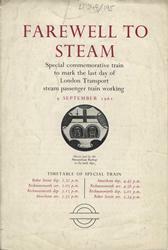 Invitations were kindly extended to London Transport Museum, who included their volunteers amongst those notified. In all, about ten volunteers attended over the two days that it ran. After not reading the invitation properly and consequently presenting myself at not just one, but two wrong reception areas I arrived a mere 15 minutes late. However, thanks to the help of a very kind receptionist (or maybe she just took pity on an obvious idiot) I was still able to gain access. 55 Broadway is, of course, an art deco treasure in its own right, but I won’t dwell on that here. On arriving at the exhibition I was presented with a guide and spent a very happy hour or more browsing the materials on display. The TfL archives are very large and as a rule are stored deep underground in a Cheshire salt mine which provides the ideal cool and dry environment for preservation of historic documentation. So the displayed material was the tip of the iceberg – and very tantalising it was too. 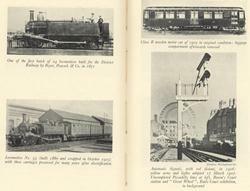 Among my favourites were a staff record book from the Metropolitan and District Railway, dated 1907, and a collection of original track diagrams covering the Circle Line. The former recorded, in meticulous copperplate handwriting, all the information that would be kept in a HR system today, whilst the latter was constructed from the flimsiest pieces of tracing paper, with many crossings out, much glue and tape. It’s a miracle that it has survived. All the main aspects of the Underground’s history was covered in a variety of ways, from files of internal memos (speedometers on tube trains took up a lot of management time in 1957) through to a full set of Metropolitan Railway station rubber stamps, presumably for use on tickets. Finally it’s worth mentioning that volunteers play an important part in the work of the unit, being involved in producing guides and indices, and also protecting material. Back in October, the Museum worked in partnership with Transport for London’s Black, Asian and Minority Ethnic staff network group to collect new staff stories as part of Black History Month. The brilliant contribution from staff on the day means that our finished edited film is now ready to showcase. Thank you so much to all involved, and to Geoff Marshall for his ever talented film making. Enjoy!